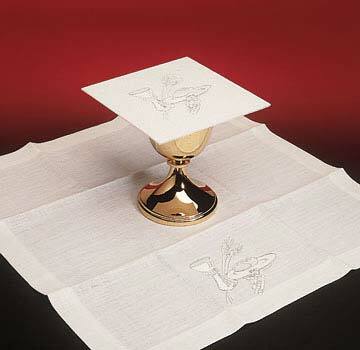 Featuring Eucharist motifs of a chalice, bread, grapes and wheat on Blended Linen of 55% linens and 45% man-made fibres. Embroidered motifs on purificator, chalice pall and corporal; not on lavabo towel. Easy to launder, wash in lukewarm (The pall should be washed in cold water).